Creative Multimedia Group – India’s driving Digital Media career catalyst, acclaimed for its activity situated Animation, VFX, Web and Graphic Design preparing, led the 2018 edition of its immensely held the art show at Hyderabad from 31 May to 2 June . The art show indicate is an intentional activity went for giving a stage to Animation and Applied Art understudies to sharpen and exhibit their illustration abilities while upholding a honorable motivation. The current year’s art indicate ‘Mahanati – The Retrospective’ — a tribute to South India’s first female super star and incredible performer ‘Savitri’ was propelled by the runaway accomplishment of her biopic ‘Mahanati’ which opened to a splendid reaction at theaters over the globe in May 2018. Over 70 true-to-life portraits of ‘Mahanati Savitri’ created by first year students of Creative Multimedia College of Fine Arts (CMFCA) were on display at the gallery. CMCFA is part of the Creative Multimedia Group at Dilsukhnagar, Hyderabad. The exemplary drawing skills of students were evident as they passionately explored a range of traditional and contemporary art forms. Deploying varied media to create realistic portraits of the thespian Savitri, students splashed the gallery walls with abstract art, photorealistic paintings, pen and ink sketch, chalk work, thermo cool-carved 3D relief work, collage work, bindi-work, crushed foil with glass painting overlay, paper-quilling work, and post-impressionism style drawings inspired by the most influential figure of western art ‘Vincent Van Gogh’. 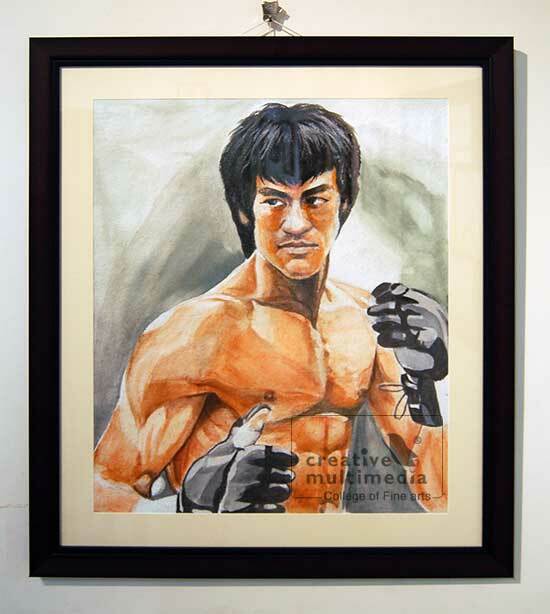 The portraits on display at the gallery are up for sale and the entire proceeds will benefit the needy members of the Movie Artists Association (MAA), Hyderabad. This is a 3D Model (student work) which depicts Mahatma Gandhi marching on a path of thorns followed by his three monkeys. The striking element of the model is that of the path of thorns turning into roses even as the Mahatma walks upon them. This is symbolic of the Mahatma’s labor and all the hardships he bore along the way, as he lead India towards its independence. The render passes for the model were done in Maya, and the compositing in Photoshop. The annual “Creative Minds” Competition witnessed another remarkable performance by students of Dilsukhnagar Arena. Amidst fierce competition from exceptionally talented participants, students of Dilsukhnagar held their own and put up a splendid performance. Their creative brilliance was on full display as they stole the show with a total of 5 prizes. Flashing the V-sign with an air of confidence, the proud winners from Dilsukhnagar Arena accepted the awards from amidst rousing applause. The 2015 edition of the Creative Minds Contest, Inter-Centre Competition organized by ARENA was held at Minerva Grand, Hyderabad on the 19th of January, 2016. Scores of talented students from Arena Animation centres across Telangana and Andhra Pradesh participated in this annual competition which attracted entries across categories including Graphic Design, 2D,3D and Stop-motionAnimation. For over a decade now, students of Dilsukhnagar Arena have been consistently winning awards at this prestigious competition which has gradually evolved into an inspirational institution committed to celebrating outstanding creative talent and exceptional training. Rajasekhar Buggaveeti,CEO of Dilsukhnagar Arena congratulated his students on their winning streak and reaffirmed Dilsukhanagar Arena’s commitment to empowering young digital media career aspirants with the finest training.